Plain grill the corn without any seasoning. Once coloured evenly serve hot with red chilli powder, salt & lemon piece. 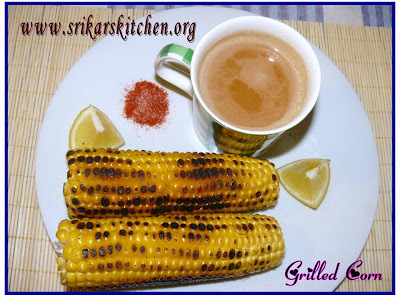 Rub the corn with lemon, chilli & salt powder. Shama Nagarajan has passed me these cute Awards .i am so excited and happy to recieve these awards. Thanks a lot dear. Any other reasons you can think of that make them Scrumptious!!! 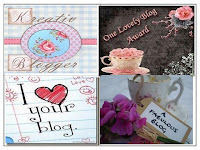 Nominate at least 7 blogs. 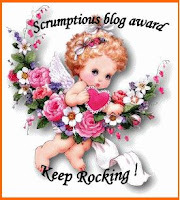 I would like pass these awards to all my blog friends. Congrats on your awards... keep rocking!! Corn looks inviting ! Congrats on the awards ! Sri! !feel like having those grilled corns rite now!congrats on ur award! Congratulations! corn looks very yummy! Congrag on ur awards. Lovely dish as well. My all time fav. Congrats on the award. The corn looks perfect!! !